Line your muffin tins with baking parchment or paper cases. Melt the butter. Zest the orange. Beat the eggs and the sugar together using an electric whisk until you have a pale and fluffy mixture. Gradually incorporate the butter, the orange flower water and finally the flour and the orange zest. Mix gently. Once you have a smooth cake mix, fill the muffin cases, transfer to the oven and bake for 15 minutes. Allow to cool a little before removing from the mould and then allow to cool thoroughly on a wire rack before icing. 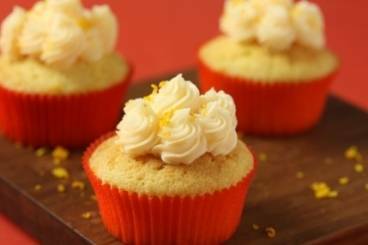 Soften the butter to room temperature and then whisk with the icing sugar and milk to make a buttercream. Use a spoon or spatula to spread the icing on to the cupcakes and decorate with hundreds and thousands, candied fruits etc.